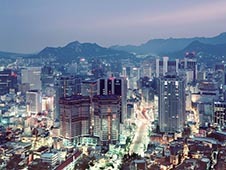 South Korea is considered a wonderful place of rest and the fifth place of honor among other countries from the Far East residents. Tourists often visit the famous ski and beach resorts in the country. For many tourists, South Korea – quite an expensive vacation, which is comparable to a trip to Australia, Japan or the Philippines. Choosing between travel, consider South Korea – you can see the "golden" skyscraper, visit the drunken fighting bulls see pearl divers and much more – the country is incredibly picturesque and diverse. Tourists who prefer a conservative holiday, be sure to be interested in the ancient pagodas and monasteries, wonderful island beaches, and other South Korean Alps. For trips around the country, use the car at one of the airports in South Korea – offers car rental services website bookingcar.ru. As passengers (front and rear), and the driver must wear seat belts while driving vehicles. On the territory of South Korea have both paid and free parking. The country can also live in any hotel or hotel - they have their own parking spaces. They can be paid or included in the price the client. Basically, parking spaces are located near the offices, airports, supermarkets and other public places. In South Korea, the cost of fuel is relatively low. In the country you can refuel with unleaded petrol with different octane, as well as gas and diesel fuel. Diesel fuel can be purchased at an average price of 1,800 won. Outside the city limits drivers allowed to travel by car with speed limits of 80 km / h.